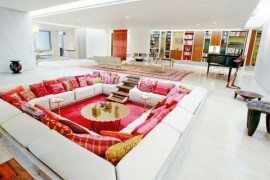 Sometimes I wish I could float above living spaces and get a new perspective on furniture design, space arrangement or color matching. 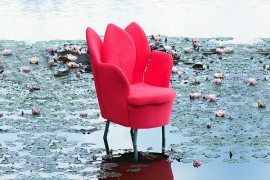 Choosing the best chairs has always been a challenge best dealt with from three points of view – comfort, visual appeal and design matching. Innovative company Herman Miller has worked with legendary designers to create stunning furniture pieces that have become a synonym for modern design. 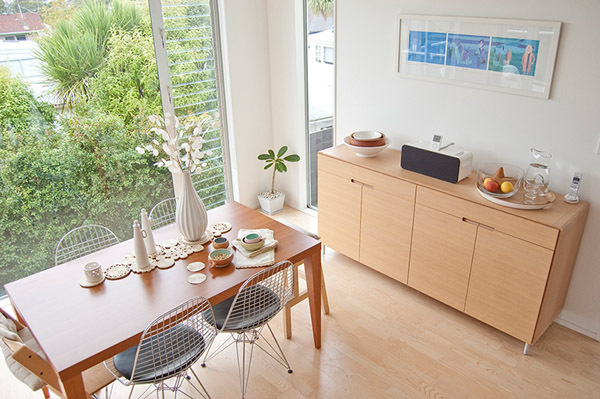 Each room of your home can become the fascinating scene where iconic Herman Miller Chairs can be proudly displayed and we will show you 10 exemplary interiors, each featuring a widely recognized chair model. 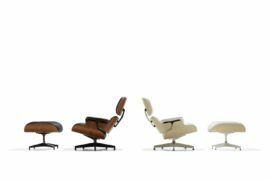 Starting with the most exciting Eames chair – the comfortably elegant Eames Lounge Chair – our journey through a home filled with Herman Miller chairs begins. 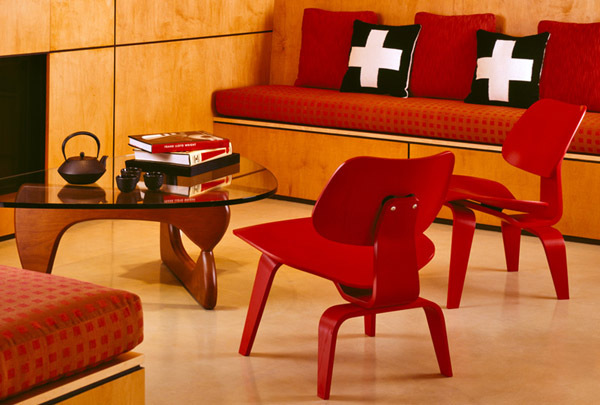 This museum-worthy sculptural seating unit has gained respect and its own place in the design world ever since Charles and Ray Eames designed it for their friend Billy Wilder, director of “Some Like It Hot” and “Sunset Blvd.” Now the fascinating shape and wide material /color range has escalated its use, making the lounge chair perfect for any taste. A media room adorned with a couple of Eames – as pictured above from RelaxHouse — becomes the perfect urban entertaining space. Showcasing a sophisticated design perfectly adapted for any living room, this inviting chair gives you freedom of movement while beautifying a modern living space. 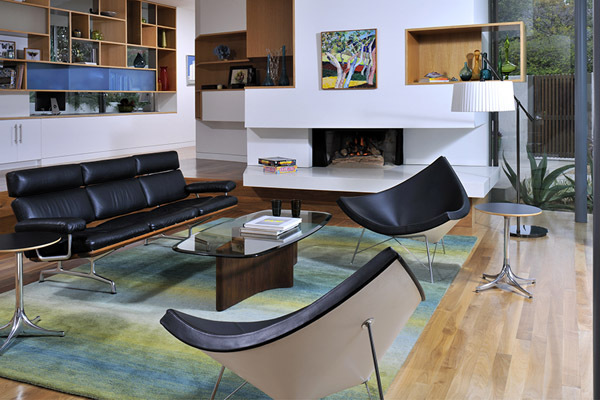 Its exotic shape remodeled American furniture design and has become part of museum displays worldwide. The Nelson Coconut Chair was inspired by the organic shape of a coconut and stylized into a modern classic by its designer — George Nelson — back in the 50s. Now, its upholstered foam rubber cushion supported by a three-leg chromed steel base invites to relaxation and daydreaming. Your home library is not complete without the comfort of a chair meant to become an island of personal space you can retreat to, a silhouette supporting your body while your mind takes a journey through fantastic story lands. 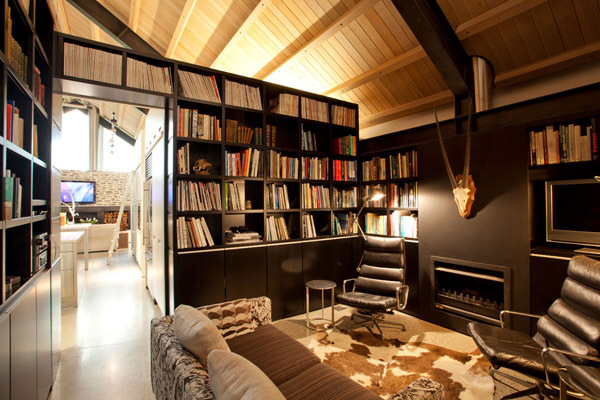 Found on Matisse, this photo displays a dark library hidden from natural light, where two Eames Soft Pad Chairs take on the role of personal immersion in each story you read. Differentiating themselves from the Aluminum Group Chairs by displaying individually upholstered cushions, these Soft Pad chairs are also perfect for office space within the home. Introduced in 1951 by Charles and Ray Eames, this exceptionally designed bent wire chair was imagined as a strong but lightweight piece of furniture for the home. Using dress forms and baskets as inspiration, the designers created an affordable chair by framing the wire with a lighter-gauge wire, thus reducing the production costs and winning the first American mechanical patent for design. Seen on Decor8blog, this dining room featuring four Eames wire chairs is a great example of modern interior design spiced with timeless furniture pieces. 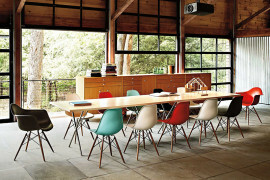 Part of the Herman Miller classics, the Eames Molded Plywood Chairs are a historic statement of how design duo Charles and Ray Eames steered modern design towards today’s design scene through their wood-molding techniques. 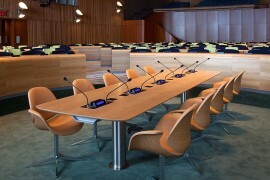 Durable, comfortable and visually appealing, the refined chairs showcase separate molded plywood panels for the back and seat, reducing the chair’s weight and introducing a sculptural mold shaped after the human body. 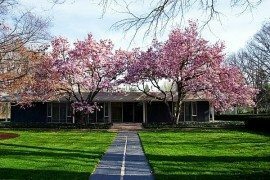 High quality and affordability ranked first in the design couple’s intentions and this can be clearly seen in their design durability. 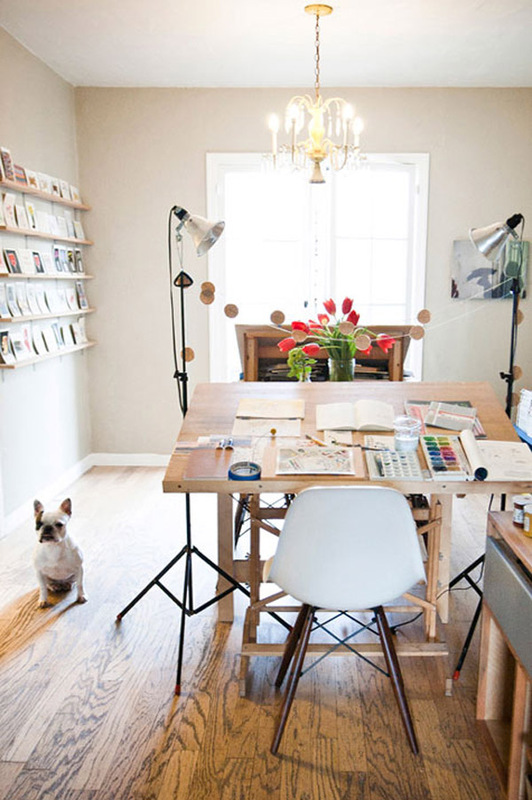 Your home workspace is all about creativity regardless your activity field. So what better way to remind yourself of this defining feature of your work than by displaying an iconic chair design? Sprucing up your workspace with an Eames Molded Plastic Side Chair with Wood Dowel Base as seen on DesignSponge is the perfect way to remind yourself than quality and innovation must go hand in hand. Drawing tables and workstations will reach their full creative potential if paired up with an ergonomic Eames plastic chair. The bedroom is supposed to be the private room where reality is dreamed up before it happens. 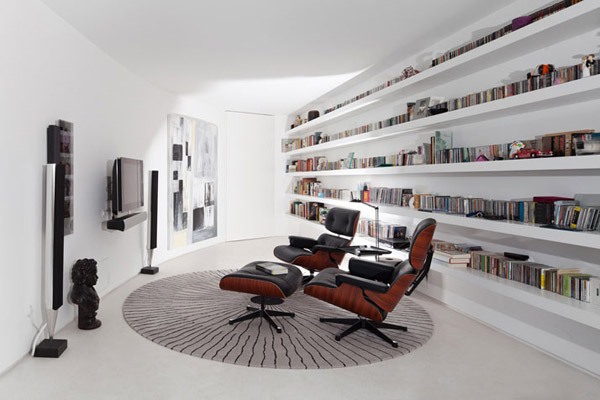 This requires comfortable places to rest, so adding an Eames chair would not only improve the aesthetic function, but also extends the comfortable places you can use to relax. Introduced in 1958, this sleek chair’s mesh was updated in 2001 with an aerated, translucent mesh called Cygnus. 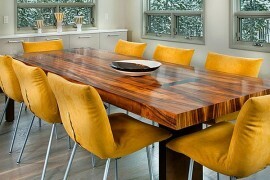 This ensures a modern sophistication through the material choice that completes the visual appeal. 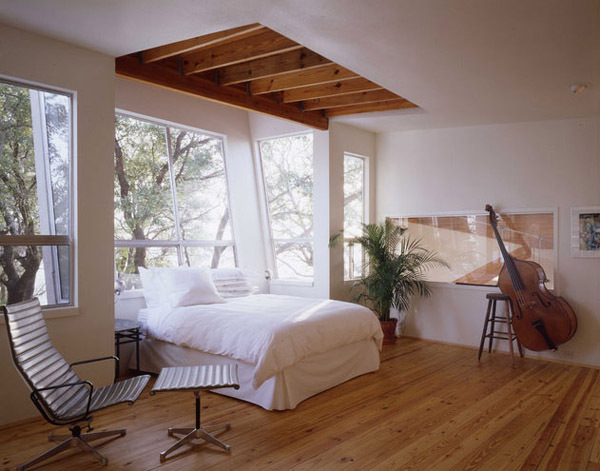 Spotted on Houzz, the light-flooded bedroom above needs nothing more than someone who cherishes a frugal lifestyle. Just one single Eames molded plastic rocking chair turns a dull bathroom into a private heaven where relaxation and cleanliness collide. 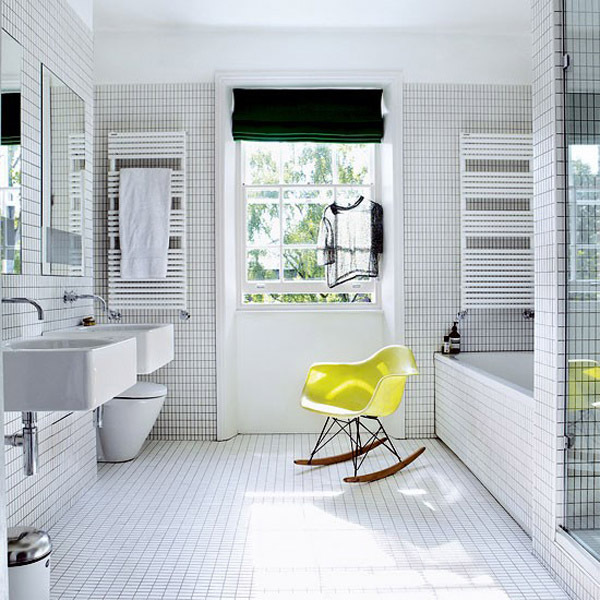 Choosing a vividly colored Eames rocking chair will prove helpful both as a design element and a surprising furniture item – its color will flourish in a monochromatic bathroom. ModernMaggie chose to remodel her bathroom in white with a pop of yellow, inspiring us to do the same. Provided that we all like to be productive at home, this home office idea will definitely help with a number of things – promote a comfortable work environment, display an aesthetically pleasant design or create an inspired setting for work. Designed by Don Chadwick and Bill Stumpf for Herman Miller, this ergonomic chair is hitting green targets with its 94% recyclable body. TakeSunset has made it clear this is the perfect chair for any home office, combining form and function into a modern design. It is available in three sizes that accommodate different shapes and weights and, according to Herman Miller’s page, it is the result of “consulting people who spend a lot of time in their chairs — older people in retirement centers”. 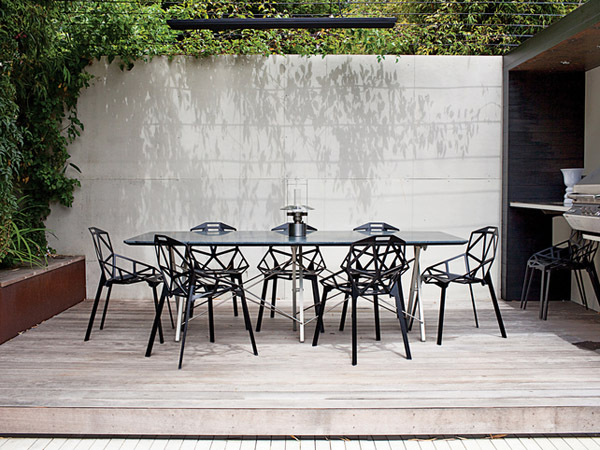 On the terrace, a bunch of Magis chairs are always welcomed, managing to take your boring outdoor dining space to new design heights. Seen at PeepMyStyles, this simple yet elegant display of modern chairs is enough to define a space where family and friends gather around the dining table to enjoy gourmet food, great conversation and the comfort of an interesting-looking chair. Designer Konstantin Grcic imagined these comfy chairs as sculptural collections of voids modeled from die-cast aluminum, creating a perfect balance between use of material, design and function. 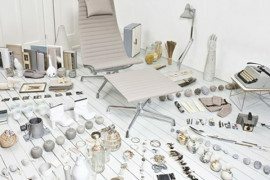 Now it’s your turn to tell us which part of your home is lacking the perfect chair. Have you found what you’re looking for yet?